A crew from the York Village Fire Department may have been the most welcome people in Lawrence and North Andover, Massachusetts, Thursday night, as they worked to feed upward of 500 firefighters, police officers, ambulance workers and other first responders battling multiple fires in a three-town area. 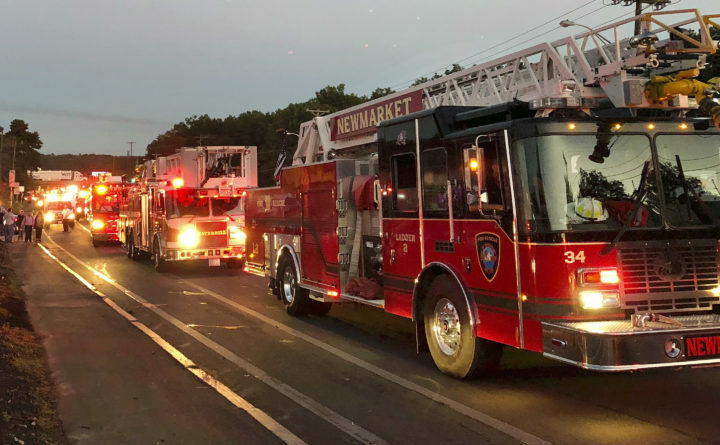 An exhausted Chris Balentine, chief of the York Village Fire Department, said Friday morning he and some of his crew “caught wind that Lawrence was having problems” around 4:30 p.m. Thursday. “Some of our guys work down in the area” as full-time firefighters, he said, so the Fire Department had a personal interest in lending a hand. Crews from throughout eastern Massachusetts and southern New Hampshire responded to the scene to extinguish between 60 and 80 fires and three gas explosions late Thursday afternoon. As things escalated, and it became clear Rockingham County, New Hampshire, fire departments were going to be making a regional response to the scene, Balentine said his crew felt their most valuable contribution would be to provide support. Attached to the Rockingham County response, they brought their “SMART” truck — with a functioning kitchen that serves hamburgers, hot dogs, coffee, snacks and water. YVFD was assigned to one of two staging areas at the North Andover Mall on the North Andover/Lawrence line. There, they set up their mobile lighting unit, which became particularly important when power was cut from the area later in the evening. They also filled air packs throughout the evening. But it was the food that firefighters most appreciated, said Balentine. The SMART truck crew began serving almost immediately with “a cache of food we already had in there. It was really appreciated. Most of these guys skipped their evening meal because the calls came in during the late afternoon,” Balentine said. Among those who stood in line for a burger was Balentine’s son Paul, a captain at YVFD and a full-time firefighter in Salem, New Hampshire. “I will tell you they were the most popular guys there. There were folks there all afternoon and evening happy to see the food show up,” he said. Paul Balentine said he is among four YVFD volunteers who work in full-time departments in the New Hampshire/Massachusetts area, and several of them were there throughout the evening as well. Balentine, who got back to York around 6 a.m., said he was glad they were able to deploy to the scene and provide such an important service. “It was a huge, huge turnout. But that’s not surprising. That’s what we do. We try to help out,” he said.